Cakewalk users rejoice! The ultimate information resource for Cakewalk's SONAR X1 is now available. But before we get to that, here's what else you'll find in this issue... articles (Propellerhead Reason tips, background vocals, audio compression, song structure), free downloads (IntelliScore, AutoGun, Frohmage, Effect Chainer, MIDI drum loops), news (Tascam, Native Instruments, Cakewalk, Musicrow, Blue Cat Audio), discussions (Gary Moore, music theory, music notation, Auralex Mopad), reviews (SampleMoog, SampleTank, Audition 3), music (Mario Gordon), videos (Celemony Melodyne, Cakewalk V-Studio 700, Sweetwater Creation Station) and more! Yes, the SONAR X1 Power! book is finally here. If you find yourself struggling with Cakewalk's latest incarnation of the SONAR music sequencing software, you can now rest easy. SONAR X1 Power! will walk you through all of the new features and changes in SONAR X1, and oh boy are there a lot of changes. The entire interface and workflow in SONAR X1 has been reimagined. The changes are so drastic that even seasoned SONAR users are having some difficultly in finding all the features. No longer! Covering SONAR X1 Producer, Studio and Essential, Sonar X1 Power! is the ninth edition of the best-selling Sonar Power book series providing detailed training for Cakewalk's Sonar X1 music recording software. Written for both new users and veteran upgraders alike, Sonar X1 Power! walks you through all of the features of the software with step-by-step instructions and exercises. Some of the new features covered include: the new global Smart Tools; the media, plug-in, and synth Browser; the enhanced track Inspector; the MultiDock tabbed window view; the Control Bar global toolbar; Screensets; new workflow in all the views (Track, Piano Roll, Staff, etc. ); plus the new features from SONAR 8.5 are also covered; and more. 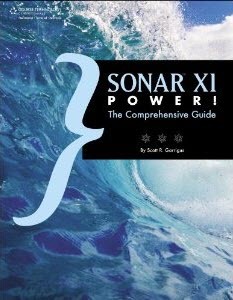 You can find more information, a table of contents, video supplements, corrections for the SONAR X1b update, and discount purchase links at: garrigus.com?PowerBooks. I want to give a special thanks to all those who have posted nice reviews about my SONAR 8 Power! book over at Amazon. Thanks to: Barry, gray36, Bricescreek "Mike", Deano, Randall A. Morter, Rickbass, R. S. Ross, Janko, Michael Stone, Mary Bedford, Frederic Gelinas, Hilton J. Day, Stephen Perry, Anthony L. Davillo, S. Smith, Troy Christianson, Matthew Critchlow, John J. Sienkiewicz, A. Williams, Bryce Dickerson, ScarletGenius, and Lance. Thanks very much! I appreciate your support. And now I need some nice reviews of my SONAR X1 Power! book. If you have already purchased SONAR X1 Power! and would like to post a nice review on Amazon, please visit my Power Books site and click on the SONAR X1 Power! link. Then click one of the order purchase links to get to the Amazon book page. Once there, scroll down to Customer Reviews and click the Create Your Own Review button. Thanks! We have two great new deals for you from two new brands... well, not new to the industry, but new to DigiFreq. AMG have been producing samples since the Eighties - over those years releasing many Internationally acclaimed, award winning and innovative libraries in conjunction with some of the World's finest musicians. And of course, we still have all the great 10% discount deals from V-Plugs, Xylote, Ohm Force, IntelliScore, Musicrow, Blue Cat Audio, Groove Monkee, Smart Loops, Live Studio Drums, Acon Digital Media, Precisionsound, RealTraps, and Drums On Demand. "Finding My Way" is Mario's first smooth jazz solo CD. It represents his journey from way back when to here and now. Mario creatively wrote, arranged and produced all 11 songs on Finding My Way. This CD contains a variety of musical styles: a few old school funk/soul jams, a lot of soulful sax playing and even a couple of vocal tunes to round out the set. Lovers of the smooth jazz format should find more than a few favorites here. Acon Digital Media Releases Acoustica 5 Audio Editing and Mastering Solution - Get 10% off! Musicrow Updates Golden Ensembles Pack for Reaktor to v2.35 and Introduces the DigiFreak - Get 10% off! Blue Cat Audio Updates Audio Analysis Plug-ins - Blue Cat's Analysis Pack - Get 10% off! Groove Monkee Releases Rock Essentials 2 MIDI Drum Loop Library - Get 10% off! Precisionsound Releases Sonic Laboratory Sound Effects Library - Get 10% off! Copyright 2011 by Scott R. Garrigus. All Rights Reserved.